You may have heard that washoku (traditional Japanese cuisine) was just recently added to the UN’s Intangible Cultural Heritage list. And of course, one of the most popular forms of washoku in the winter season is nabe (Japanese hot pot). Nabe is a Japanese soul food, a favorite cold-weather dish of people of all ages and walks of life. Nabe is enormously appealing for its variety of styles and flavors, but another attractive aspect of the dish is way in which it is cooked and eaten. It is a truly communal food, eaten with family or friends sitting around a single nabe pot, and can teach us much about Japanese culture. Here are some facts about nabe, which we hope will allow you to enjoy your winter in Japan even more. Needless to say, nabe are an essential part of any Japanese home during the winter. According to an internet survey, over ninety percent of Japanese people enjoy eating this winter delicacy. Another survey shows that the average Japanese partakes of this dish eleven times every winter, which works out to once every nine days! There are many variations of nabe, such as yose-nabe (nabe with meat, fish and vegetables), kimchi-nabe, yudofu-nabe, and sukiyaki-nabe. To begin with, what kind of food is nabe? One dictionary defines it as “a Japanese dish served in the same pot that was used to cook it with, instead of presenting it in a separate dishware.” But that doesn’t tell the whole story. Typically, several people gather around one nabe pot, cooking the ingredients together on a portable cooking stove, and then as the ingredients are cooked through, taking whatever they like into their own bowls. Usually, large-sized pots are used since it is a dish that is based essentially on several people dining together, but in a kaiseki meal (traditional Japanese course), a single-portion nabe may be served. 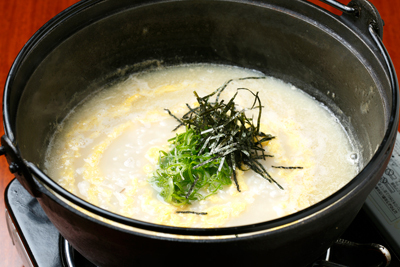 Nowadays, individual-sized nabe pots are popular kitchen items. When do people feel like having nabe? Most Japanese would answer: maybe on an especially cold day, or during a gathering of family or friends, or simply when preparing and cooking a meal is just too much of a bother. Indeed, nabe is quite a simple dish to prepare, since all you have to do is boil some chopped vegetables, meat, fish, and tofu together into a large ceramic pot. What's more, the dish is healthy and nutritious - the perfect winter meal for busy homemakers. Finally, atmosphere is also an important part of any nabe experience. 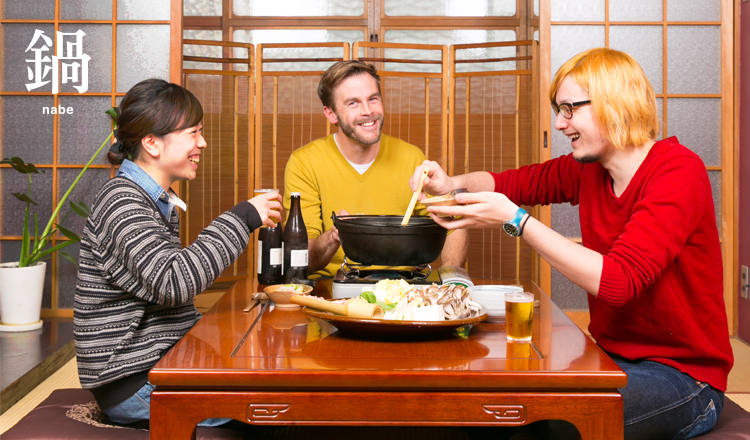 Naturally, sitting in a circle around the nabe pot is conducive to conversation and a relaxed two-hour nabe session is a perfect length of time for socializing. Sharing nabe is a collaborative event, where everybody cooks and eats together. Some might prefer to have drink alcohol along with the meal, which makes the experience all the more enjoyable. You don’t need to worry too much about dining etiquette. It’s perfectly OK to use your own chopsticks to take food from the same nabe, since all present are family and friends. Eating nabe is a part of food culture that provides great opportunity for mingling and getting to know others. This perhaps explains why it is inseparable to Japanese daily life. A person who takes charge of cooking nabe is called nabe-bugyō (bugyō means ‘samurai commissioner’). Generally, a nabe-bugyo likes to either take control and cook the entire dish by themselves, or give fastidious cooking instructions and commentaries. Unless you enjoy the sarcasm of being called this name, remember not to dominate the cooking unasked! 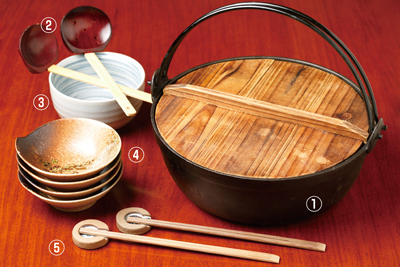 The following are some of the basic utensils and tableware used to cook and serve nabe. These are all cooking tools quite common in most Japanese households, and once you have these you should be all set to cook your own. They also make the perfect souvenir if you are interested in trying nabe cooking back home! The nabe pot comes in many different sizes, styles such as do-nabe ceramic pots, tempura-nabe, suki-nabe, and yudofu-nabe. The picture shows a cast iron nabe pot. A ladle for serving soup, and is convenient if each nabe participant has one. The spoon with holes is used for scooping softer ingredients such as tofu, which can be near-impossible to catch with chopsticks. A jar-like container used for collecting the froth (aku) removed from the surface of the broth. Bones or shells from chicken, fish or seafood are also disposed of here. A pear-shaped bowl used for serving. 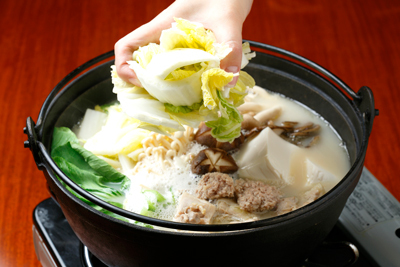 When serving nabe, the narrower end is used to slide the piping-hot ingredients into the bowl. Because nabe is a Japanese dish, chopsticks are normally used. Chopstick rests are not necessarily used in every setting, but they do give a more formal and polite feel to the meal if used. 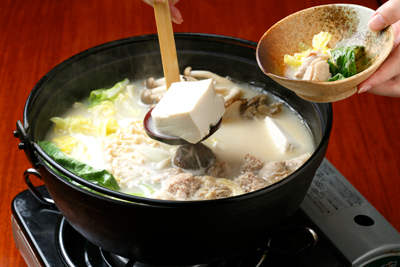 Nabe is a healthy dish, since many different kinds of ingredients are cooked and eaten at once. 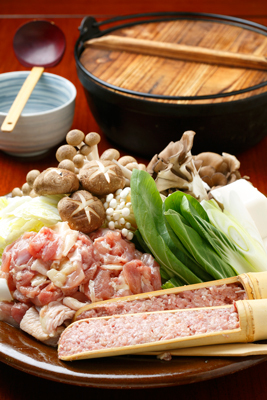 Depending on the style, a great variety of ingredients are used in nabe cooking. 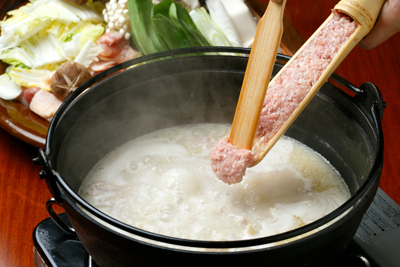 Let’s have a closer look at the flavors and roles of some common nabe ingredients. One of the most common winter vegetables in Japan. An nabe staple, which goes well with all other ingredients. Delicious when softened after thoroughly cooked. Negi is sliced diagonally when used in nabe cooking. Because of its distinct aroma, it is also used chopped and raw as a topping. Although originally from China, bok choy are also grown in Japan. It is rarely used in Japanese-style nabe, but delectable in Chinese paitang soup. 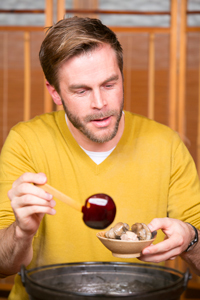 Mushrooms come in many different kinds, such as shiitake, maitake, shimeji, and enokidake. They add texture, as well as increase the flavour and depth of the dashi broth. Chicken meatballs are made from minced or ground chicken mixed with spices. The more you chew, the more its savory flavors spread throughout your mouth. Usually cut into bite-sized pieces. Depending on the style of nabe, beef or pork may also be used. Some nabe use only seafood, such as octopus, crab, and squid. An original Japanese food: soft, smooth and delicious. Be careful when putting boiled tofu to your mouth- it gets extremely hot! Herbs or spices with potent flavors and aromas, served in small amounts. Dried chili peppers, salt, and yuzukosho (chili paste with yuzu peel) are common accompaniments for nabe. 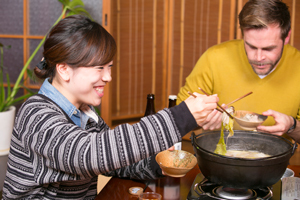 Here are a couple of beginner rules when eating a nabe meal. Although etiquette differs slightly depending on the region, as well as your dining companions, you should be fine as long as you have these basics memorized! 1. Pour dashi stock into the nabe pot, and heat it until its bubbling. 2. Add any meat first, since it takes longer to cook than the other ingredients. 3. Put in some vegetables and tofu. Add more ingredients as you eat the first round. 4. Take your own servings with your own chopsticks or renge (soup spoon). It is a nice gesture to dish out the first round of servings to your family or friends. 5. 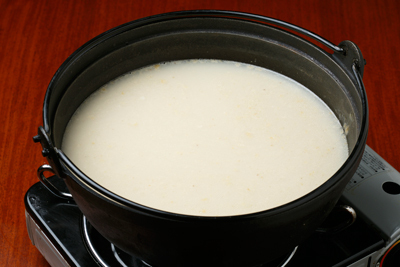 When all the ingredients have been eaten, pour in some rinsed white rice along with beaten eggs to make a filling zōsui (rice porridge) with the remaining broth. Sprinkle some shredded nori and green onions on top, and – voilà! Enjoy a scrumptious zosui to finish the meal. 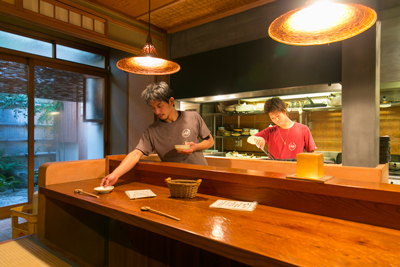 The restaurant Tsukitokage lent invaluable help on this report. Tsukitokage’s must-try dishes are traditional obanzai and other dishes featuring local jidori chicken from Kyoto and Kumamoto.